You can’t believe this stuff really happened! Kim Jong-Il fancies himself a cinema expert so in order to up the North Korean game, he has the most popular South Korean actress kidnapped and then later her film director ex-husband as well. She is housed in luxury while he is sent to a work camp after trying to escape. 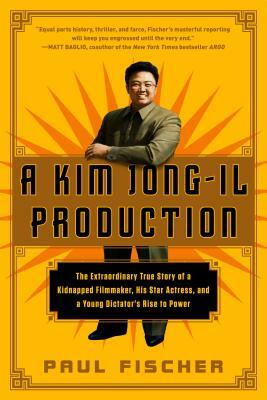 The story examines Kim’s fascination with movies, the situation of the kidnapped South Koreans in his charge and their work together. It’s quite a whackadoodle story with quite a bit of tension as they formulate their escape plans. I was not very familiar with North Korean history before reading Fischer's book but the premise intrigued me. The plot, (dictator abducts his neighbor's most famous director and actress to force them to make “quality” propaganda films) sounds ridiculous, but it is true and the author does an excellent job of telling the story with all the action and suspense it deserves. A must read for anyone who is interested in current affairs. Library Journal Top Ten Book of the Year! The Extraordinary True Story of Kim Jong-Il’s kidnapping of the golden couple of South Korean Cinema, The Movies They Were Forced to Make, and Their Daring Escape. Before becoming the world’s most notorious dictator, Kim Jong-Il ran North Korea’s Ministry for Propaganda and all its film studios. Underwhelmed by the pool of talent available to him he took drastic steps, ordering the kidnap of Choi Eun-Hee (Madame Choi) – South Korea’s most famous actress – and her ex-husband Shin Sang-Ok, the country’s most famous filmmaker. But as Madame Choi and Shin Shang-Ok begin to make North Korea’s greatest films, they hatch a plan of escape worthy of a blockbuster Hollywood ending. A Kim Jong-Il Production is that rarest of books: a wildly entertaining, cunningly told story that offers a rare glimpse into a nation still wrapped in mystery.